Pauls are open water surface pursuit predators, similar to tuna, billfish, makos, and dolphins. They have a relatively stiff teardrop-shaped body, large dorsal fin and pectoral fins for maneuvering, and powerful tail flukes for propulsion. Species of Paul also feature eight eyes: large sideways-facing eyes for distant early warning, front-facing eyes for prey targeting, and upward-facing eyes and eyes on its chins for detecting threats and opportunities above and below. It has two lower jaws and one upper jaw. The upper jaw, with two rows of teeth, are used for piercing and holding prey, while the lower single rows of teeth are used to saw back and forth to cut flesh for consumption. In healthy specimens, the lower row teeth fit between the two rows on the upper jaw. Pauls, like other life forms on Leviticus, have no bones, but their bodies are sitffened by chitin-like rods for fast swimming and strong jaws. It has separate orifices for eating and breathing. Its teeth are composed of hydrated silica, commonly known as opal. 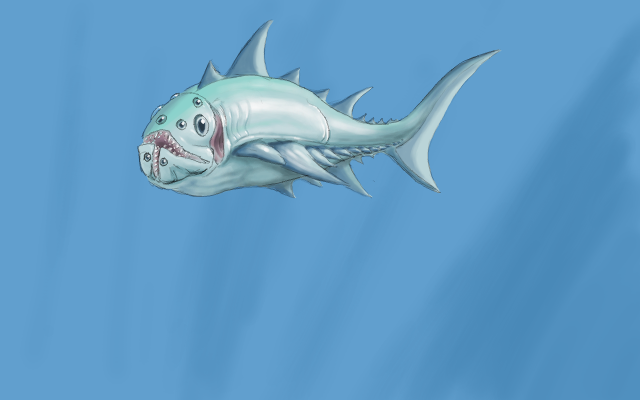 The paul is believed to be distantly related to its sometime companion, the tunnel hunter known as the luke, as its lateral fins are thought to have evolved from parapodia similar to that of the lukes. Often, tunnel hunters will partner with a "courser" species that hunts out in the open and uses speed to chase down prey. The tunnel hunter will flush prey for the courser to catch, and the courser drives prey to ground for the tunnel hunter. This behavior is similar to that which has been observed with coyotes and badgers, groupers and moray eels, and groupers and sea snakes. 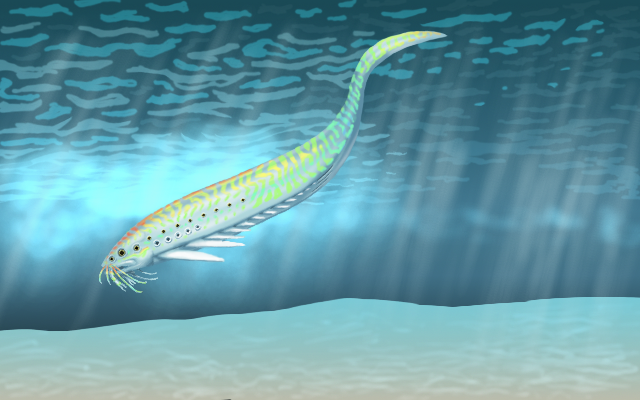 The paul's large lateral eyes may indicate that it spends a lot of time near the bottom of the inland seas and continental shelves, where the relatively shallow depth allows dim illumination during the day - although in this image it is clearly near the surface in open water during the full light of day. The structure of the mouth indicates a large game predator. While the opalteeth of the pauls are highly valued throughout the human reach, fishing them is often dangerous work. The above image captures a pod of lukes devouring a recently dead jonah. The segemented body of versitile luke features retractable jaws and legs, allowing them to move quickly underwater as well as on land. The legs have keratin claws tipped with an opal hard point as meat-hooks for digging into prey when they wrap around it. Underwater, each segment will extend their pair of lung-gills, just above the legs, giving their sides a frilly appearance. On land, the lung-gills are retracted and muscular contractions ventilate them. Each segment has its own set of vital organs - heart, ganglion, lung-gills, kidneys, etc. A main nerve cord, two great blood vessels, and a digestive system are shared between the segments. The primary brain is in the head. Severing the nerve cord keeps the brain from controlling the "downstream" segments, usually resulting in the luke writhing around like a cut earthworm. Opening one of the great vessels triggers muscular contractions in the segment that squeeze it shut, preventing massive blood loss (this greatly reduces endurance, but allows time for the vessel to heal). Just about any part of the luke can regrow if severed. Even cutting one in half lets the two halves grow into new lukes. Only the lukes jaws and claws have any hardness; the rest of the creature works as a muscular hydrostat. Jonahs comprise several species of large mouth brooders, roughly equivalent in size to right whales. The female lays between three and fifteen eggs at a time, which are fertilized by a male and immediately taken into a brood pouch in the male's throat. The eggs incubate and then hatch there. The young feed on plankton caught in the father's sieves and grow until they are ready to venture out on their own. Early on, they will leave their father's mouth for short periods of time before returning. As they grow they become bolder and spend more time swimming, until finally they swim off on their own. The researcher who discovered and described the pterosomes (Greek for "fin-body") was getting quite tired of the pretentious (as she saw it) use of biblical names for the megafauna of Leviticus, and started giving her discoveries more traditional-sounding names. This didn't stop other people from blithely ignoring the original name and calling these animals josephs. Josephs have a body shaped much like a willow-leaf, with a cluster of manipulatory and sensory tentacles clustered around the mouth. Like many of Leviticus's "fish," they possess a row of lateral fins derived from peripodia, although on the Joseph these tend to be small. Several eyespots cluster around the head end, and josephs have further simple eyes running down the length of their body. These creatures are typically iridescent. The degree of iridescence can be changed rapidly, and seems to be used for communication within joseph bands. Josephs derive their common name from their habit of building shelters. In sandy areas, these may take the form of "sandcastles", where other building material is available, they may incorporate these into the shelters. Materials are held together by an adhesive bio-cement formed by glands just behind the mouth. This reminded some of Leviticus's early settlers of Joseph, husband of Mary, who was said to be a carpenter. Joseph structures usually form interconnected tunnels. Different species form structures of different complexity, from simple tubes in the sand to elaborate mazes. Many species of joseph are truly social, traveling in family groups. The ancestral condition is thought to be matrilocal and matrilineal, with males dispersing to new groups upon maturity while females remain in their natal groups. Social structure is generally based around female matrilines, with female dominance in a group determined by birth (the daughters of a dominant mother will be just below her in the hierarchy). Male rank is generally determined by strength and contests with other males. Depending on species, males may dominate females, females may keep the males subordinate, or the sexes may form parallel dominance structures. Josephs tend to be generalist omnivores, although many species have evolved toward a mostly herbivorous diet, while others function as scavangers. They forage in groups in "kelp" forests, reefs, or "seagrass" beds. These animals are adaptable and opportunistic, and have been observed using simple tools to pry food out of crevices or crack shelled prey. They seem to exhibit relatively high levels of intelligence for life on Leviticus. Scientists have found no evidence that josephs are any more intelligent than an Earth chicken and their use of tools is thought to be purely instinctive. However, there are fringe elements who believe that jospehs are as bright as Earth primates, and some claim (based on exaggeration and extensive use of confirmation bias) that josephs are fully sapient but that we merely have not learned to communicate with them yet. These beliefs are very much in the minority on Leviticus, but appear to be more popular back on Earth where some of the more extreme adherents claim that we have much to learn from the josephs if only we would listen. The pictured individual is a 10-kilogram juvenile peter skittering around on sand at low tide. Adults of these species typically reach between 60 to 100 kilograms. Legs let them run around on sand and rock and seaweed at low tide. Fins (modified legs, on the abdomen behind the walking legs) let them swim in the water. Despite the insectoid/crustacean appearance, they have simple (not compound) eyes on recessed stalks (shrouded by eye-ridges) that allow the eyes some degree of mobility. Like many higher Leviticus animals, they have a three-part jaw - two independently mobile jaws below, one above. Peters can JUMP! 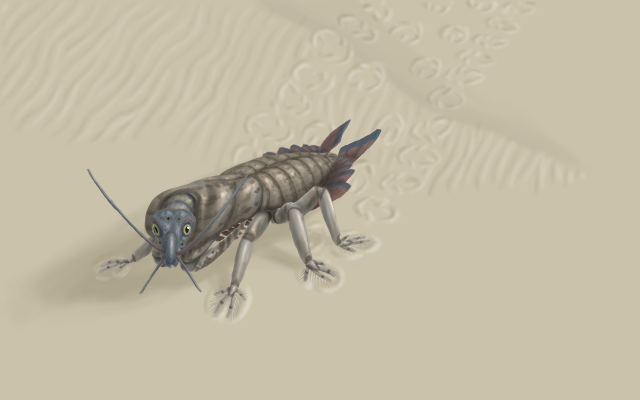 On land, they have been known to leap several meters out of ambush to stab with their raptorial claws (in above image, the bladed raptorial appendages are folded underneath the thorax body segment). The shell is a low-quality opal, whose opalescence is largely obscured by pigmentation. The raptorial blades have the highest silica content found in the creature, with opal strengthening and a silica coating similar to those of paul teeth (although not nearly as pretty). This gives the claws the strength and hardness of silica, the sharpness of an obsidian blade, and the toughness of nacre. Peters shed their exoskeleton in segments, preventing the extreme vulnerability of Earth arthropods after shedding and allowing significantly larger sizes (in addition to forced ventilation respiration and stiffened beams in the exoskeleton for structural support). Sometimes compared to jellyfish, sea cucumbers, or cephalopods, marks are muscular bags with several eyestalks and tentacles. If disturbed, it releases vast quantities of sticky, reeking slime. Female marks are universally significantly larger than the males; the female's larger size allows brooding large quantities of eggs. At the height of their breeding cycle (which always takes place at highest tide when the moon is overhead), the males fill their tentacles with motile fertilizing gametes, which detach from the male's body go swimming away on their own to find and impregnate a female. Then the males die. Their bodies will often wash ashore in huge quantities, forming a slick of decomposing meat that stinks up the coastline until the carcases are scavenged. One species of mark, the red-spot mark, is found in shallow waters and the intertidal region. It is a generalist predator/scavenger, and an accomplished nest raider. Females are about the size of a beach ball, while males are about the size of a softball. Where red-spot marks are common, up to 90 percent of luke nests can be lost to mark predation, helps keep luke populations down. In addition, the presence of red-spot marks on the prowl are an indication to be alert to lukes in the area. Other species of mark are pelagic. Shoals of these marks can be targeted by pauls, which drive them up against the surface and feed. The characteristic reek of mark slime can alert paul fishermen that pauls are nearby; they can then follow the smell downwind, find where the marks are splashing at the surface, and set bait on their lines to catch the pauls. If cleaned of slime and soaked in fresh water and then vinegar, marks are considered delicious. They can stay alive for up to a week in air if not exposed to fresh water, longer if chilled, allowing them to be easily transported. Baptists are one of the few complex life forms on Leviticus that can withstand fresh water. They are covered with an impermeable waxy skin that seals them from osmotic exchange, and can switch between breathing sea water and breathing air to keep fresh water away from their gills. Baptists are herbivores, with a tadpole-shaped body and a flattened head, which allows them to stay close to the bottom in fast-movign water. They possess sensory tentacles around their head and a suction-based sucker under their body for sticking to rocks in rushing rivers. They forage for food in the sea at high tide, and then retreat into rivers during lower tides to digest, allowing them to rest in an area free of predators. The larger species of baptists can grow as large as a white sturgeon or wels catfish, but most species are roughly salmon-sized. The males are substantially larger than the females, have sharp tusks, and dominant bull baptists will guard harems of females. Both sexes have sharp spines on their fins. The bulls are highly territorial, and will attack anything that they think is invading their territory or challenging their status. The females are highly protective of their calves, and they will likewise attack if they feel their offspring are threatened. Because they are often found in relatively shallow water, it is thought that they cannot adequately judge the size of humans wading in the water because they can only see their legs and feet, so that they will often attack people much larger than themselves. It is not uncommon for a large baptist to knock a wader down into the water, and they have been known to drown waders thus knocked down. Victims of these attacks may end up with cuts or punctures from fin-spines or tusks. Attacks by smaller baptists on people wearing waders or boots, on the other hand, range from a nuisance to amusing. Baptist flesh contains many chitinous stiffening fibers and has an unpleasant soapy flavor. They are not considered good eating, although they are not toxic and are fairly nutritious. They are not commercially exploited, although they may be pursued by sport fishermen for trophies or catch and release. The namesake of these critters is John the Baptist, who was known for immersing people into the river Jordan as part of a religious ritual. Whether any victim of a baptist attack has had a religious experience during the process is not recorded. 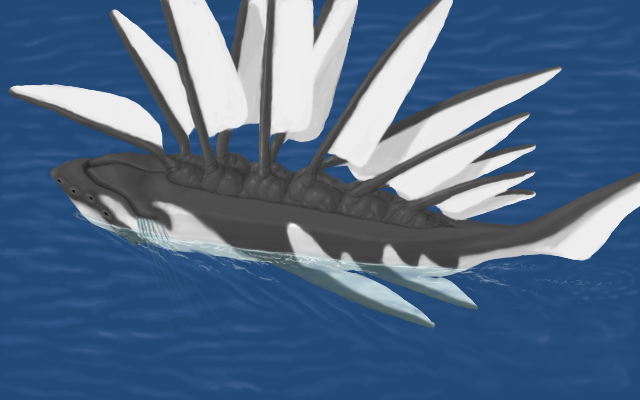 The majestic Solomon has evolved a series of dorsal sailfins, which may be oriented along with the tail to catch the wind and provide lift. The body is mostly air bladders for buoyancy; the bladders can be voided if it needs to dive. The body shape gives it a good hull-shape for hydroplaning -- when startled, it drops its tail into the water and swishes it back and forth for propulsion, causing the body to plane. It can dart several hundred meters over the top of the ocean using this technique. They rarely come close to shore, and sightings are uncommon and thought to signal imminent good fortune. Unlike their namesake, Solomons are thought to be monogamous, with bereft males and females refusing to mate for the remainder of their lives. The rolling fang is a primary predator in the habitable fjord regions of Commonwealth. It an armored, wolverine-sized pack hunter that lives on the clifftops. Rolling fangs attack grazer animals by rolling themselves into balls and plummeting down hillsides, crashing into the herbivores, often knocking them over and stunning them. They then unroll themselves and strike. A permanently airborne species that propels itself in a manner similar to hot-air balloons. Another permanently airborne species, stormrunners are the only known complex form of life evolved to live their entire lives within a storm system. Images (c) 2013, Luke Campbell.